Anyone who had the pleasure of knowing Dorothy doesn’t need me to tell them how kind and gentle and generous and compassionate she was. As people, we all change the world around us, at least a little. Some of us are Earth-shakers, and our ripples spread out and around and through history. And those ripples may be good or ill. Most of us create more modest ripples. We have an impact on family and perhaps a few friends, possibly a co-worker or even a stranger now and then. Please understand, these modest, everyday, just-plain-folk ripples are an integral part of the societal oceans we inhabit, and without them we’re just isolated islands or bits of aimless driftwood. They’re essential, but modest. …then there are a special few. Those whose ripples appear quiet and unassuming. They may come from people pleasant enough, kind even, but we may believe those ripples are certain to be short-lived and absolutely will not travel far. Don’t be fooled. When created by those special few, those deceptively quiet ripples can go on and on and on. I first met Dorothy in 1981 or ’82 when I was asked to take over an adult writing class she attended semester after semester. We hit it off—of course, she hit it off with everyone!—and she eventually invited me to be her guest at a writers group (ripples). This wonderful group (two groups, in fact: Allied Authors and Fictioneers) included literary agent Larry Sternig as well as a host of other local literary luminaries. Larry offered to represent my fiction and garnered me my first appearance in a hard cover book (ripples). A few years later, health issues prompted him to offer me a partnership in the agency (ripples), and I took over the agency when Larry passed away in 1999 (ripples). As an agent, I have had the pleasure of “starting” the publishing careers of nearly a dozen brand-new writers, and while they may have found an agent elsewhere and that agent may have sold their initial books and those sales may have been to the same publishers and may have entertained the same readers, Dorothy played a very real part in launching those writers’ careers (ripples). Years ago, I invited a lifelong friend to join the Allied Authors of Wisconsin (the two groups had merged into one), and he has become a pivotal member. (Needless to say, he and Dorothy hit it off too). He took upon himself the task of chronicling the group’s history, members past and present, publishing accomplishments and the group’s place in Wisconsin’s rich literary legacy. He recently collected and collated the papers and history of Wisconsin’s renowned children’s book writer, Betty Ren Wright, and presented it to the state historical society, and he is doing similar work for other writers. If Dorothy had not invited me, I could not have invited him, and this treasury of information may well have been lost. I have absolutely no doubt that Dorothy’s life above and beyond the narrow confines of my contact with her created other ripples. Ripples in the lives of her fellow nurses and healthcare professionals. Ripples in her patients’ lives, the lives of staff and her fellow residents at the Congregational Home, and doubtless uncounted ripples in the lives of complete strangers…anyone seeing her kind, always-smiling face could not help but smile in return and have a better day for it. We are all the richer for having known her. 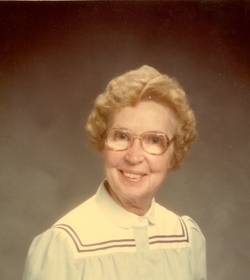 Dorothy Tofte passed away Nov. 19, 2014. Read the obituary here. This entry was posted on Monday, November 24th, 2014 at 7:25 pm	and posted in News. You can follow any responses to this entry through the RSS 2.0 feed. Every writer group needs someone like Dorothy — a member who always finds something positive in every reading and has the innate ability to encourage others. She will be missed, yes, but I pray her spirit of joy for the craft (and fellowship with her friends) will never be lost.